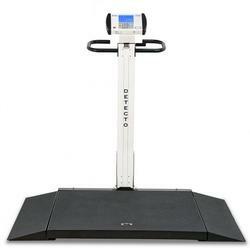 DETECTO�s portable wheelchair scales offer time-saving and patient comfort benefits. 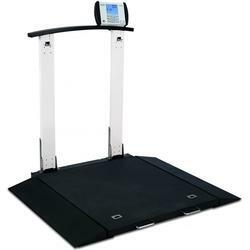 The scales features 1,000 lb / 450 kg capacity, optional Wi-Fi for EMR/EHR, vertical foldup storage, two-way built-in ramps for accessibility from both sides, large 32 in x 36 in / 81 cm x 91 cm platform, clinical-grade accuracy to 0.2 lb / 0.1 kg, battery or AC power, and up to 99 tares (optional) to store wheelchair weights for efficient patient weighing. 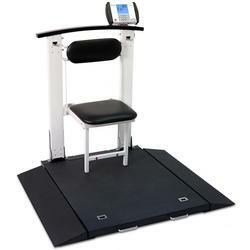 All the scale's columns fold down and latch securely for easy transport and vertical foldup storage requiring minimal floor space.